I'm all about making memories. So when my now-husband and I met and started dating, we were all about having fun and being creative. Not once did we go to a movie during that time. It's not that we were opposed to movies or anything, it was more about doing the kind of things we'd better remember. We went rollerblading, hiking, and biking. We worked out at the gym together, played frisbee golf, and had kite wars. He was training for a marathon at the time, and since long distance running for me consisted of 1-2 miles, I rollerbladed or biked next to him while he ran. We went to a Stomp concert, a play, and to the park. We went out to dinner--a lot--and hung out with his family since they lived nearby. We took weekend trips to visit my family, and I even tagged along on a trip to Australia that he and his sister had planned. She probably wasn't too thrilled to have me along, but I fell in love with Australia and even more in love the the man I married not long after that. Looking back, those are some of the best memories I have. Not only did we do some really fun things, but there's something magical about the time when two people fall in love. It's one of the reasons I love to write about it. The giddiness, the first look, first touch, first kiss. Nothing is more magical than that. Well, reading this post made ME all giddy inside. :) I'll never forget the changes my mind and heart went through when I met my husband. We've been married 27 years and still in love. :) Falling in to that heart-experience is nothing short of a miracle, and reading about it makes me relive mine over and over again. 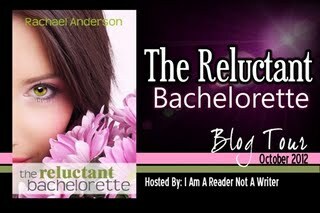 The Reluctant Bachelorette is a grabbing title. Love it! Thanks so much for being a part of this tour! Really appreciate it!